I've been to Cologne before, or rather, I've been through Cologne before, on my way during my trip from Paris to Hong Kong via rail. The train from Brussels to Moscow passed through Cologne, and included a 30 minute stop in Cologne. Just enough time, I was told, to go and check out the massive and impressive Cologne Cathedral. Unfortunately, Stan and Ollie, my train attendants on the train, wouldn't let me off the train, so instead I had to do with looking at the nice train shed roof from my cabin while waiting to carry on to Moscow. This time, I had 2 days in Cologne, and can attest that had I been allowed off the train, I could have seen the cathedral, for it's just steps from the train station. I learnt that upon leaving the train station on arriving in Cologne. Unfortunately, after 15 minutes of aimless wandering, I figured out that my hotel was on the other side of the train station. A smarter traveller than I would have printed out a map from their train station to their hotel ahead of time, as opposed to I, who just knew that it was "about 3 blocks" from the train station. 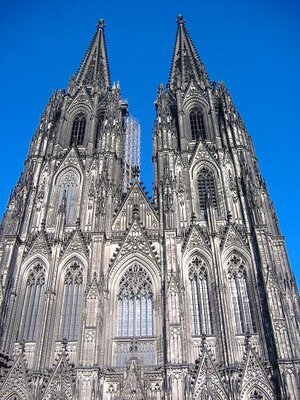 The Cologne Cathedral is a massive and imposing structure. 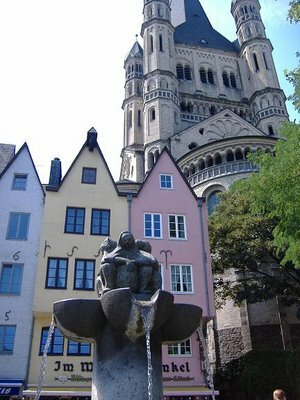 It's very tall, and as you wander around Cologne, you are sure to be constantly getting peeks of the cathedral. At night, they light it up and it glows like a star, but during the day it appears almost jet black, much like the monolith in 2001. I kept expecting monkeys to touch it, and then starting to beat each other with sticks. Now, some of you are probably wondering why a city in Germany shares it's name with Old Spice and C.K. One. Back in 1709, French revolutionaires hiding out from the man in Cologne meet up with Johann Maria Farina, an Italian working at 4711 Glockengasse, was making a refreshing men's perfume to be worn or consumed, that would have "the odor of an Italian spring morning after the rain." The French, upon returing to Paris, called the perfume "eau de Cologne", which has stuck. 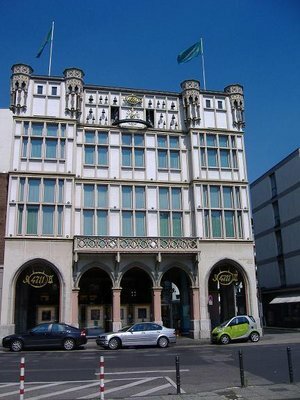 The house still stands today, and has a nice little glockenspiel clock. 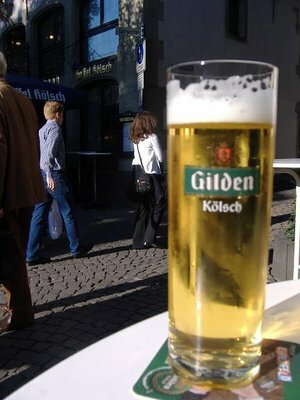 The sun was shining in Cologne, and after days of rain in Brussels, I was ready to sit outside and have a beer or two. The local brew is called Kölsch, clear beer with a bright straw yellow hue that is often served in little .2 L glasses. It was also very inexpensive, and it made me wonder why, when everything else in Europe is so pricey, that the beer in Cologne bars was not of much cost. I soon figured out the answer, as I watched people walk around with open beer bottles. It is even cheaper to go and buy a .5 L bottle of beer at the local store, and consume it without having to pay the overhead for waiters. 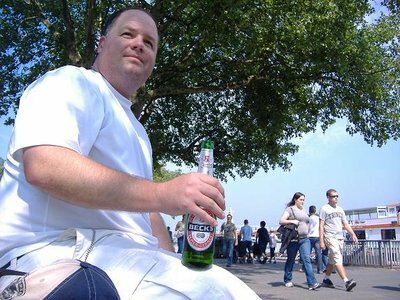 After learning that, I mostly bought beer for €1.40 (€1.32 if you returned an empty) at the store instead of the €3 beer from bars, and sat in the main square or along the banks of the Rhine river enjoying the sun and my inexpensive beer. 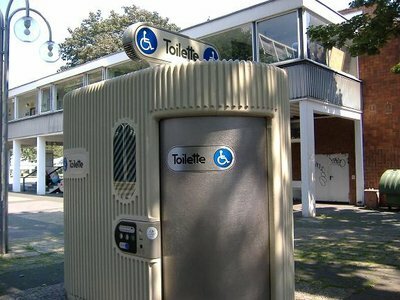 And in case you were wondering, public toilets are available, for when nature calls after a .5 L bottle of beer. And here in NYC it's the homeless drunks...all you need is the brown paper bag. And maybe a shopping cart full of trinkets.